It was the stunning picture on the first page of your article. 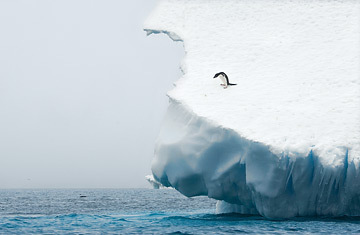 A lonely penguin on the glacier gazing at the Antarctic sea deep below him indicates the fate of an endangered human being surrounded by global warming. What is urgent for us is to recognize where we are standing now. Namely we are on the edge of the collapsing cliff and there is no way out unless we find solutions by ourselves. Thank you for showing so many ways to make a difference. It is our turn to think deep and act immediately.